The last post focused on homes with low ceilings. I showed an antique home with seven-foot ceilings that I designed 16 years ago! I want to show you something a wonderful reader sent me a few months ago. She sent me her starter home that she purchased in her 20’s in 1979. She said that she only went in because at the time, she was a realtor and needed to use the john. Once in side, she fell in love with the square-ish rooms and high ceilings. And she realized the immense potential. Fast forward 29 years later when she and her husband put their starter home on the market. I’ll give you a sec to pick yourself up off the floor. I know, because I ended up there too! From the plainest-jane starter home ever to curb appeal for days and days! I wouldn’t change a thing! Sorry, we don’t know the paint color, but here are some other wonderful exterior paint colors. A lot of you are afraid to make changes for fear that they will look silly. And that is a realistic fear. There is so much in the marketplace that is misleading. This is one of my worst. The so-called “Traditional” Front Door. This is not an upgrade and these doors are definitely NOT traditional, modern or Victorian. They are wrong. The oval. The curve. These do not exist anywhere in history. But we’ve been exposed to them for so long that we think that they must have existed before. Go ahead. Prove me wrong. I have searched but I can’t find it. The curve exists in some old French pieces, but it would be wonderfully weathered and decayed and definitely not made of cherry wood! And definitely NOT fiberglass fake wood grain. If it’s sold at Lowe’s or Home Depot and is called “classic” or “traditional” it probably isn’t. Of course. Leaded glass definitely did exist!!! But it looked like the above in Victorian or Edwardian homes. Couldn’t find the original source but it is said to be painted Farrow and Ball – Off Black. In Georgian, Colonial, Federal homes the leaded glass often took on a shape like these lovely side lights and transom. Let’s go back to homes built primarily mid-century in the 1950s and 1960s. There are a LOT of them and some of them are in some very expensive areas. While they may look like starter homes, they may be forever homes too! I once worked on a total piece of crap split level in Larchmont that was sold for 1.3 million dollars back in 2003! But, did you know? I grew up (until I was 15) in a 50’s ranch home in southern Indiana. This is it. And it’s hardly changed except for the big maple tree in the front that died. I wish I had some interior shots. But, I remember it vividly. The front is achingly typical, but the living room in the back of the home had two walls of nearly floor to ceiling windows. Otherwise, it featured every single cliché decorative element of the era. Raise your hand if you’ve ever lived in a home with one of these multi-colored slate floors. This was our floor— exactly! It butted up against a modest sized eat-in kitchen that featured orange-maple cabinets with a coarse grain. Our knobs were big, flat and round. Good God, we had those exact silver canisters! And we had the de rigueur boomerang formica counter-top in turquoise. Below, the quintessential ranch home. For starters, I would paint the brick and then beef up the portico. This one has a lot of potential. But maybe your home looks like the one below. If your home was built in the 1970s. That’s an extra challenge, for sure, but please check out what fabulous interior designer Lauren Liess did with her 1970s mess. Via Hooked on Houses. Let’s look at some typical things that need to go. I could never figure out these weird spindle things. Usually, they are oak. Painting them white makes them go from a zero to a one. Please get rid of them! The popcorn ceiling and walls have to go too. Options are 1/4″ sheet rock or sometimes skim-coating will work if it’s not too pronounced. Instead of the weird spindle divider, I would possibly just make it a wall. Or put in a half wall with columns. Sometimes one side is a cabinet or a book-case. How about interior windows. I love this look! Mouldings can go everywhere that’s a flat ugly wall. Glass block almost always needs to go. Replace with a real wall or interior windows as shown above. Things like wall-to-wall carpeting need to go too, unless it’s something like sea-grass or it’s a bedroom or basement. I’ve left out some stuff, I’m sure like ugly wood or pine paneling that was installed after 1950. The large cove moulding is a wonderful trick for extending the height of the ceiling. If you notice, where the curve begins is actually where the ceiling begins but because of the curve, there’s an illusion of greater height. Beautiful crown moulding and wainscoting add so much to these rooms. This crown moulding that extends out over the ceiling also creates the illusion of more height. This would also be a great moulding for a more contemporary look. This is another way to extend the height of the ceiling. Wonderful custom-millwork. Love the shallow coffer, too. More of that coming! Another home with an eight-foot ceiling and beautiful architectural detailing. Painting a ceiling a deeper shade will make it appear to be higher. This ceiling moulding lifts the ceiling up higher than it is. My living room with a cove ceiling and moulding applied to the ceiling. Here is another version of a shallow coffer. This one has beadboard but it could be done without, as well. While this wainscoting is going to be too fancy for most homes, especially with a lower ceiling, what I want to point out is that for an eight foot ceiling, the chair rail should be no higher than 36″. Do not ever cut the wall in half with a chair rail and wainscoting. Oh, I’ve seen it and it’s awful looking. A chair rail that’s at about 66″-72″ is fine though. Love this treatment with Scalamandre wallpaper. So many mid-century homes have boring flat doors. Jennifer Squires did a post that shows how she turned her flat, boring door into one of distinction. Small windows in your mid-century home? Here’s a trick that integrates the window into the composition of the wall so that it feels natural. Of course, always put window treatments up as high as possible to lift the eye up. Beautiful mouldings, but a lower ceiling. Don’t be afraid of color, particularly in smaller rooms. While this is most likely an old home because of the deep windows, there’s no reason that one couldn’t turn their boxy dining room into a close facsimile of this. Bunny’s and John Rosselli’s home doesn’t have particularly high ceilings. But charming details and elements that go up under the crown give the illusion of more height. It’s important to know that a lower ceiling height doesn’t mean keeping everything small and dinky. The ceilings are dedinitely not more than eight feet. I love her use of color and look; she has stained wood trim! The beautiful artwork has picture lights and that contributes to a soft ambient light. I love this kitchen! Megan’s attention to detail is interesting but not too much. There’s the wonderful ceiling detail and the cabinets go right up to meet it. I think this is the sort of kitchen that would look fantastic in most ranch homes. It’s not overtly traditional, but not contemporary either. Oh wait. For more of Nancy Keyes’ fabulous kitchen please click here. Hope y’all in the US had a wonderful Thanksgiving. My sons were here and it was such a treat! I’ve always hated oval glass in doors. To my mind it screams ‘trailer home’. Laurel, Another excellent blog post, thank you! While scrolling through the photos of those so called “traditional” doors with unattractive oval windows, I thought of an invaluable architectural resource book I have in my design library. It’s called, “Get Your House Right” by acclaimed architectural designer Marianne Cusato. 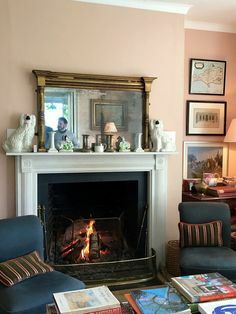 It illustrates what to avoid and what is architecturally correct, regarding shape and proportion, for exterior and interior design elements; such as moldings, arches, fireplaces, roof lines. I wish every builder, architect and homeowner lived by these historically proven guidelines; the world would be such a prettier place! 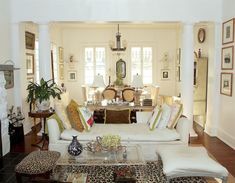 Hi Laurel – Your ideas about how to make a low ceiling look higher are so interesting. I just purchased a 1950 center entrance colonial that needs a ton of work. I’ve read that using a paint with a sheen on the ceiling can throw light around and make the ceiling seem taller. I wonder if anyone has found that to be true? We have 7.5′ ceilings throughout most of the house, with an addition that has 8.5′ ceilings. I thought that crown molding was out of the convo as it would make the ceiling look lower, but your ideas to focus molding on the ceiling itself sounds wonderful. Thanks for having such a great website that is so inspiring! Thanks so much. Yes, putting the moulding on the ceiling is an optical illusion. Also painting the ceiling a pale blue-green-gray like Benjamin Moore Opal Essence 680 for example– one of my favorites will make the ceiling appear to be floating. I really loved this post. It has made me more aware of the architecture of doors. Something I haven’t thought about a lot, even though I love Interior Design. I always learn something when I read your blog, which is why I like it so much. You want the unlacquered brass. Oh, I understand now. 🙂 I don’t know how long I can handle that bright gold finish waiting on it to age naturally, ha ha!!! I’m glad to know the information now though. I forgot to add that you can put some lemon juice on the brass to hasten the oxidation. 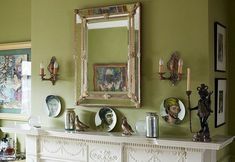 I had a client oh gosh, maybe 18 years ago who purchased a very expensive unlacquered brass light fixture hanging over his dining room table from Ann Morris Antiques. Well… he put lemon juice all over it and it worked beautifully. Maybe get one handle unlacquered and experiment before getting a whole bunch of ’em. Too funny. We had neighbors next door in our townhouse who bought the most ginormous concrete urn I’ve ever seen. TACKY, to say the least. I too, had the urge to smear it with bright orange spray paint. Hey Laurel! Had to drag myself away from the political scene which has become a horrifying reality show! Lol but not funny. This post is so chick full of brilliant ideas that I don’t know where to start! Omg, that before and after square ranch is simply OUTSTANDING. Right? I think the paint colors are Kendall Charcoal on the brick and BM Whipple Blue front door. I just spec’d the same door color for a cape in Northport. I too abhor those etched glass faux Victorian doors!! A pet peeve of mine for years. So much nicer to have a personalized colored front door. I don’t mind ranches or even split ranches…we have a zillion on Long Island. But split levels. Ugh . Just the worst architectural design in American history. To walk in the front door and simultaneously see the LR FLOOR ar eye level while also seeing the ceiling of the lower room is beyond bad….Did color consulting/ drapes for one client one time in a split. It’s the ultimate designers challenge for sure. Not sure of the blue but on my monitor it has very little if any green in it, but doesn’t appear to go periwinkle or indigo either. Maybe closer to Champion Cobalt 2061-20. Hi again. Good question about maintaining the brick in cold or hot climates for that matter. Actually, I love the flaking paint look, but of course, one wouldn’t want it flaking a little bit. so we have-in our newly remodeled place that’s almost ready- two original wonderful windows-real deal windows-one bay window in the dining area, and one-garden window in one of the bedrooms, totally charming, added later(I guess to compensate on a total lack of any view but the row of cypresses..)) Both wooden grids-white in the dining, stained in the bedroom. I love garden windows because they have window sill..something that I’m used to have but in another hemisphere. We also have one window that’s too wide that’s you probably are talking about, and it has this wider separation in the middle(family room). I can’t say I hate it. I c a n say I’m perplexed as to how to dress it. 4-5 drapes? a bit silly. Shades or blinds? never tried these. Ok, I guess I’ll figure it out. All the rest of the windows are new and newer and you know what it means in the state of CA, right? you’re not allowed to have single pane (well fine with me since we back to the street..but even if we weren’t -you can leave old windows, but the moment you have to install new ones, no inspection will let you do single pane.Energy saving code. the GC covered some of these for us, and it’s quite a cheap horror. Then we decided to change the sad door to the patio and realized there are options, lol. The customer service was sick and tired of us since we bugged them for a week-but the door looks much better. First, the grids are outside, not taped inside. Second, we made it with that option of leaving just the narrow side panels to open and close, if we don’t want it open. Huge improvement. Yet it is still vinyl. Because..well..it’s really really really expensive to install a decent window. And if you need several? I saw some amazing ones. If I was only changing windows and not gutting the place and building it from the studs up-I might’ve considered it. Also, local thing-y-termites. These always win here. So people less go for wood because of that too, in my opinion. I so, so agree-windows and doors make the house. We went to see one place when house hunting..they were 2 days on the market.Nothing special. But gorgeous windows(only on the front side though..)) I told my husband “they’ll sell tomorrow”-and right I was. Because of the windows. PS yes to 50% paint on the ceilings!..I even went with more than that in the living where the ceiling is slanted, and the paint is lighter. The GC said he had never saw a house yet with so many cans of paint. He works with all sorts of big guys, Malibu and all-so I didn’t believe him. On the other hand-he likes the colors. I was surrounded by men, and men only during all this remodel. So hard. You constantly need to calm them down, even putting everything else aside. PPS And of course I’ve pinned everything too. What’s new. Thanks so much for all of that! I notice in the Roselli house the switch plates and plug in plates are white against colored backgrounds. I’ve always tried to hide them by painting them the same color as the background. Your opinion please. Do you mean the Delaney home? The captions are always below unless otherwise specified. I don’t have an opinion about that. I don’t mind white switch plates and I’ve never painted them. My paper hanger will cover them with the wallpaper though which is nice. Oh wow! I’m having trouble visualizing the weird but great looking muntin treatment. But your question is a great one, indeed! I do live in the same county as the Clintons. I used to live a lot closer four years ago when I lived in northern Westchester County. Do you know about the tiny house movement? It’s quite fascinating and I did a post on it a while back. O.M.G. Our house was every “before” picture you posted. Spindles in walnut color. Popcorn ceiling. Wrought iron railings by the basement stairs. Stingy or non-existent moldings and flat hollow-core mahogany doors. My husband took the spindles down, the rest remain until I find modern updates to the rest (because sometimes doing nothing is better that doing it wrong). When I retire in eight months there’s going to be a lot of sawdust and hammering sounds and paint smell in the air (yes I’ll open a window). I was waiting for this post! Thank you! I think the first house works so well because it is very Georgian. She has a center front door with symmetrical windows on either side that are taller than they are wide. I’m having trouble with mine because they are double windows that are 84″ wide and 60″ tall. I don’t see any examples of window dressings for windows like this in the post, but would love to see some if you continue this series (you mentioned you might do a curb appeal post as well, yea!!!). The second old kitchen with the red and green linoleum floors? Those are almost my cabinets…pine with the knots in the doors, except that it looks like those doors are actually made with the knotty pine panels…which is what my walls are (oh my!!!). I may send you some pictures of my house…you may be able to use them as the “don’t” pictures, lol!!! I’m thinking of painting my brick, enhancing the portico over the porch, replacing the wrought iron posts with wooden ones, already removed my shutters (they aren’t appropriate for those wide double windows), and replacing my front door (probably a traditional 6-panel door, but definitely with a new coat of paint). Love your comments and so glad you’re finding ideas that are helpful. I know… Double windows that are wider than they are tall started appearing in the 20th century and then after world war II went into massive overdrive along with the ubiquitous “picture window.” yuck. And now, we’re stuck with ’em. Well, it is possible to change them, but that comes with a hefty price tag and if it’s a masonry home, fuhhhget about it. 1. Stingy narrow wood trim and baseboards. It’s a major cost/effort to replace, I know, but makes a huge difference to do so. a. No modern house should have shutters because there is no point to them. They are reduced to trim to “dress up” a house. Great point about the shutters. People forget that originally, they were not merely decorative. They actually SHUT for privacy and/or to keep out the elements. I’m definitely one to not add them unless they make sense. In fact, if you go to Wednesday’s post and look at the first image of the antique home in Waccabuc, please notice that there are no shutters. That tile floor…it was a must have…called “Kentile”, the advertisement boasted it would last a lifetime. Pretty sure it is an asbestos product, so if anyone is motivated by this wonderful post to remove it, follow the rules. What I appreciated most in this post is the spotlight on front doors. I hate, hate, hate the phony leaded glass and ridiculous attempt at a Victorian look, which usually turns up on a Cape Cod house. It rivals vinyl shutters, drilled into the siding, which don’t fit the windows properly. Oh my on the Kentile. The floor might last forever, even if it sends the inhabitants to an early death. :[ Hopefully, it’s only a problem if one tries to remove it. And yes, follow the rules! I had to pick myself off the floor when I scrolled down and saw our house (before) that turned into our “dream house”! We still miss that house! It was published a couple of times and I do have interior shots. We are lucky to have 10′ ceilings on the first floor of our present home but only 8.5′ upstairs. 8.5 isn’t terrible but they feel lower because of the height downstairs. When we remodeled the master bath we used moldings similar to the “painted house” on a smaller scale and a black ceiling. All helps in raising the feeling of height. I will send you the interior photos on your website. You are welcome to use them. I will put together some before/afters of our current home and send them in a few days. Thanks so much! Another great post. I have those doors 🙁 The good news, I didn’t buy them. It is going to cost a chunk of change to replace them too. Our development is full of them. Full, I tell you. They ruin many a lovely lady(house). Ba da Bing! This is a terrific post! Touching all of my pet peeves although I’ve been blessed not to see a popcorn wall. I’m a realtor and it is discouraging when I see endless raised ranches and 60’s (and 70’s, 80’s etc.) capes that have stayed “faithful” to their original design, spindles and all. So many good examples here of what can reasonably be done to enhance your home. By the way I KNEW I was going to love this particular post when you started with the oval glass doors! I’m heartened to find so many who feel the same way about the oval fake glass doors. I remember the first time I saw one and it was in a small Cape Home. I am just seeing so many comments on house. I actually never referred to it as a ranch either. It is a one story “U” shaped house custom built in the mid 40s. We loved that it looked so much smaller than it is. As for the windows! One of my HUGE pet peeves are new windows. Yes, those are single pane true divided light windows that were custom made because “no one” wants them anymore. Most of these rooms are eight foot ceilings. I can tell by the position of the doors and the size of the windows and also the size of the furniture. But I need to research Colorado ranch homes because maybe stylistically there’s something in them that makes visualizing these changes difficult. Certainly vaulted ceilings create an extra challenge, but there are still plenty of things that can be done that would look terrific. Thank you, thank you, thank you, Laurel, for your comments about the pseudo-Victorian, big-box store doors. They are one of my pet peeves. They look wrong on every house I see them on, because they are just wrong; period. It kills my soul to see someone rip out period doors and put these in. They are expensive – silly people think it’s an upgrade but it is just a mistake. Thank you for such an informative post! My husband & I have downsized into a small mid-century ranch that we think has a lot of potential (in Indiana, no less! ), so your post was of great interest. I have a question about choosing mouldings for rooms with 8′ ceilings. Is there a rule of thumb for size so that the mouldings look in proportion to the ceiling height? Also, I’d love to see a post on improving curb appeal for these homes. Thanks, again, for all your terrific posts. I look forward to checking my inbox every Sunday! That’s a great question concerning size of the crown mouldings. But it has to do with the shape of the moulding. 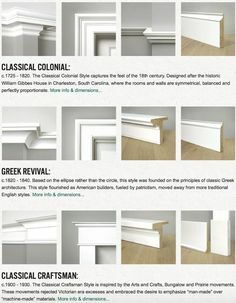 If doing a classic moulding, I wouldn’t go larger than about 5″. Some of these are larger because the bottom part is straight and then there’s another moulding below. An example is the green room with the white wainscoting. And I’m sure their interiors are full of fugly ersatz “traditional” (not) furnishings. Fine. Call me a snob. lol I don’t care if someone doesn’t have a lot of money. It’s not about that because the fake and phony is sometimes quite expensive. And it proliferates everywhere. I live in the shadow of New York City and it is surprisingly and phenomenally unsophisticated on the whole. Oh well. OMg! For a second I thought maybe I was the author of your comment and just didn’t remember…haha! shutters are a HUGE issue for me, I see them crazily hung all the time. No one seems to care, tho. Everything you listed drives me NUTS. I love shutters but I have double width windows so I’d need to find folding shutters that would open up large enough to actually cover each. Anyway. Tnx for this comment! That’s a great idea too! Thanks so much Rebecca! I lived in a neighborhood which had largely vintage 1980 colonial style homes and Cape Cod style. Half of them have those doors and in every case look ridiculous. Sorry folks in your hood did that to the grand old ladies. They just don’t know any better. But I feel if one is going to own a piece of history, it would be a good idea to learn more about it before mucking it up. My husband and I have purchased a small 1400 sq ft house. 1963 vintage. While walking it was discovered on a corner where lovey,trees graced its “homely” Exterior. I later went to the door and kindly asked the gentleman had he considered selling . As the story,goes we were able to make a walk thru … we were convinced it was going to,suit,our,needs as soon to,be retried”couple. May I send pics ? We are taking it to a more d century faux eiisher design .interiors can easily,be minipulated. . Low ceilings which we each,prefer. Spacious living area.’kitchen and dining/ library promises. Gorgeous homes, gorgeous post. Love everything. You know what I especially love? the beautiful central lights. The first one-transparent, translucent-is mind blowing. Everybody always says how you shouldn’t put a central light if your ceilings are standard-and I listened and listened, and decided not to listen in the end. It doesn’t bring attention to “oh ceilings are so low”. Quite the opposite-you have something beautiful to look at, instead of a sad expanse of the ceiling. So I broke these rules in every room lol, which makes me very happy. Except for the guest room-the light there is amazing being rose glass..but the lamp itself seems missing details..)) so I try to figure them out. i put there some crystals but it asks for more/different, and in a very loud voice at that..
Amazing examples and explanations on colors and moldings. We were to add moldings-but then when we gutted the place it appeared that a) no insulation b) roof needs to be redone c) asbestos abatement guys cut off the new HVAC parts, just in case..in short, no moldings. lol. Our new place was built either in 68 or 70. But you know what? It had such a wonderful vibe. With all its shortcomings which were plenty. So I was impulsive.And frankly, stupid too lol But. Almost everything can be improved, to some degree-the intangible feeling you’ve arrived is either there, or it’s not..
Love Lauren Liess, and this home of hers is a work of art. That was supposed to be a short post. Did you see the link in the post to Lauren Liess’ home. I think it is her previous home. It is the classic 70’s architectural monstrosity. But inside, she created something cool, casual and immensely stylish! My feeling is if something has been around for a few hundred years and we’re still loving it, then it’s probably going to be around forever.